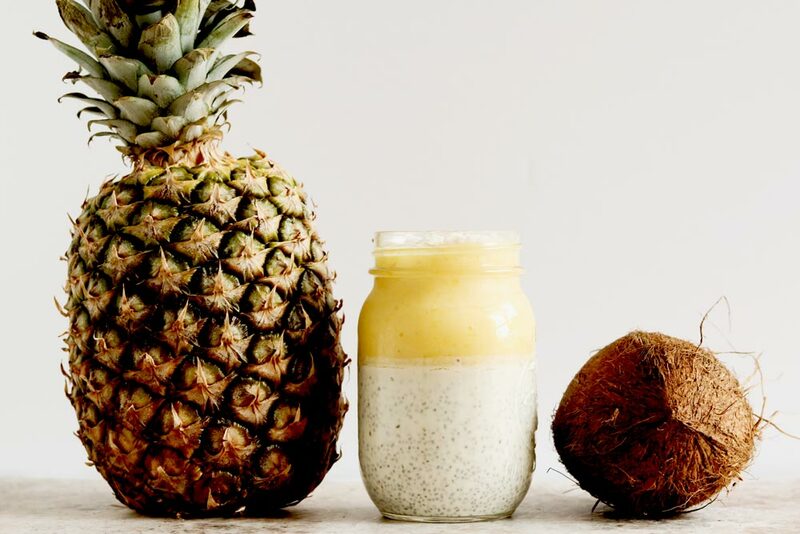 Inside scoop: This incredibly delicious Pina Colada Chia Pudding is the perfect way to get the taste of pina colada in a healthy dessert. 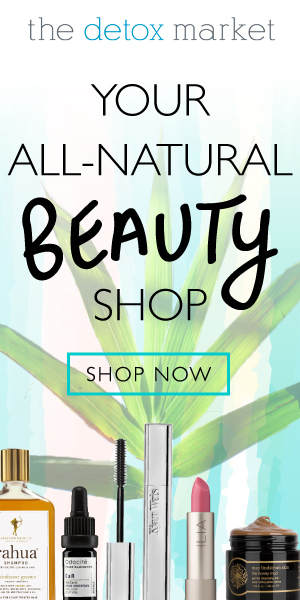 If you love pina coladas….getting caught in the rain…. Of course we were going to be cheesy like that, it’s how we roll. In all seriousness though, we haven’t really had a pina colada in a long time. Maybe it was around the time we hit our twenties and decided we wanted to be sophisticated and drink sangria instead of frozen blended drinks? Who knows really? All we know right now is that those sugar laced pineapple coconut drinks of delight were like sipping on a tropical dessert that got us a little sauced. And boy were they ever fun! Oh, how we love being grown ups. No more pina coladas for us, not only did that peak about 10 years ago (yes yes, we’re 10 years older than ‘in our twenties’), but those drinks are like pixie sticks in frozen beverage form. So, we must get that sweet sweet taste of pina colada, or pineapple coconut, in a different way. World, meet Pina Colada Chia Pudding – the frighteningly delicious, and surprisingly grown up way to get your pina colada fix (but don’t be fooled by the grown up factor, your kids are going to lick the bowl of this chia pudding recipe). 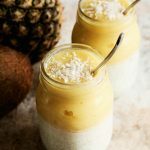 This Pina Colada Chia Pudding is made with all kinds of amazing ingredients, and tastes just like the pineapple coconut pina colada you know and love. 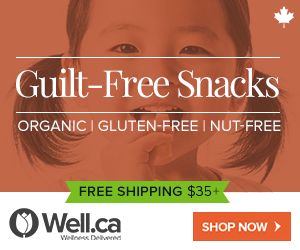 It has pineapple, which contains the beneficial enzyme, bromelain that helps to break down food. 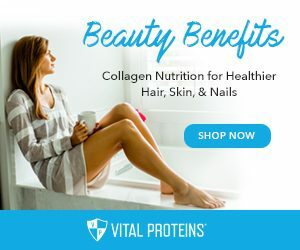 It also contains full fat coconut milk, which is high in healthy fats and helps to support energy and metabolism, as well as chia seeds, which are rich in prebiotics, omega 3 fatty acids and protein. 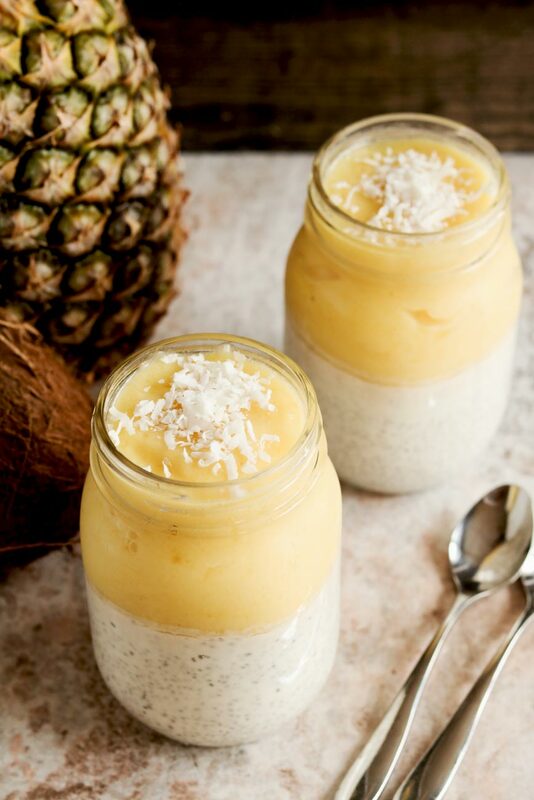 This pina colada chia pudding has no added sugars, and can be put together in a whopping 5 minutes! 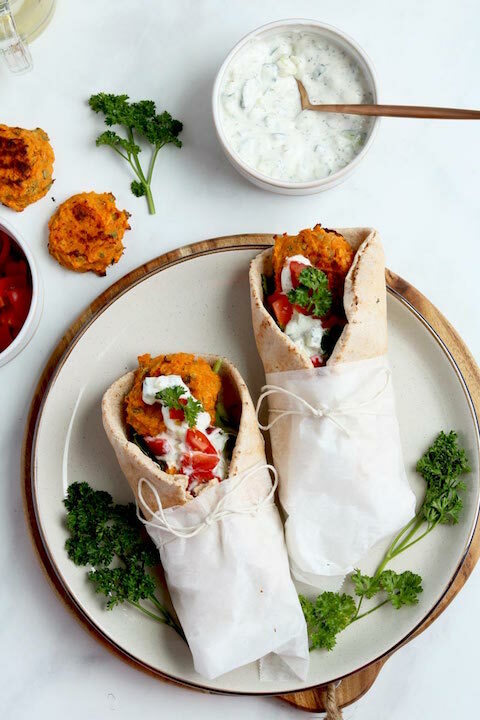 Talk about keeping it healthy, simple, and delicious. But, don’t take our word for it; see for yourself by testing out the recipe! And, if you love a good chia pudding recipe that taste just like other, more traditional foods, you’re going to love our Pumpkin Pie Chia Pudding recipe as well – tastes just like pumpkin pie! 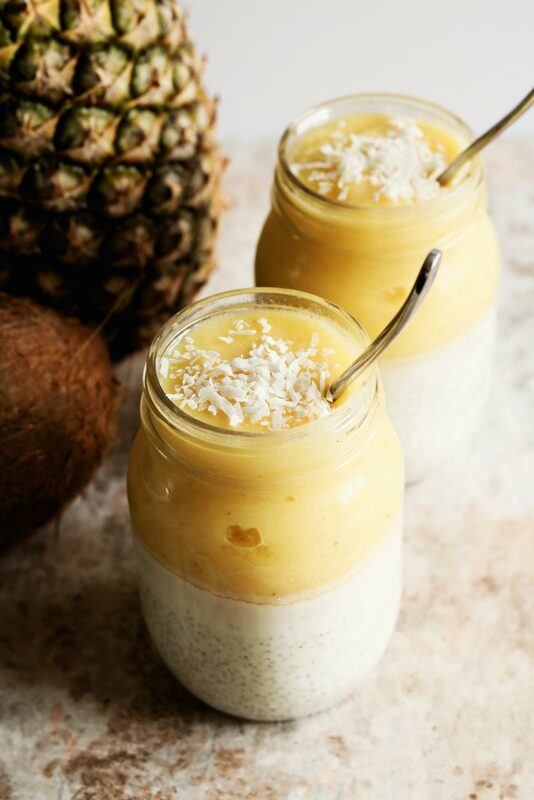 This incredibly delicious Pina Colada Chia Pudding is the perfect way to get the taste of pina colada in a healthy dessert. First mix the banana and pineapple in food processor or blender until the fruit are pureed. 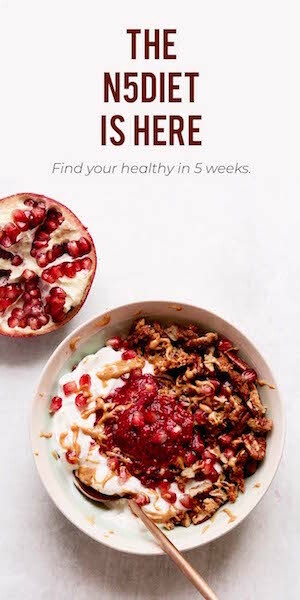 Blend all the ingredients in a bowl until chia seeds are well mixed. Alternatively, you can layer the mixture as well. 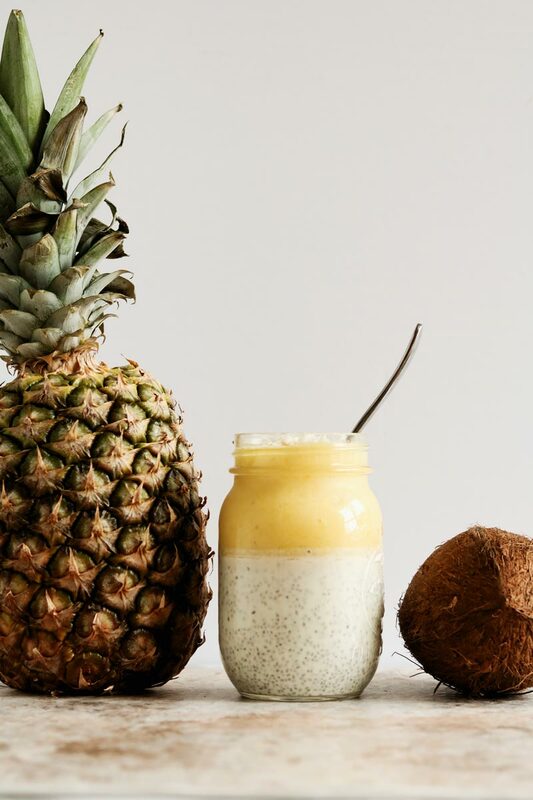 We would recommend using more pineapple blend than chia pudding. Place in fridge for at least 30 minutes to allow the seeds to soak in the moisture. 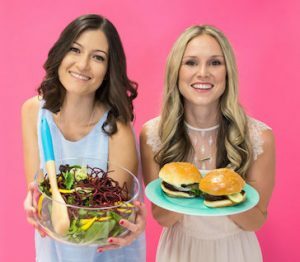 You can eat right away, however it's even better the next day. Notes: If you love the taste of coconut you can add 1/3 cup unsweetened shredded coconut or coconut chunks into the chia pudding. You can also sprinkle some toasted coconut on top of the pudding.